* i finished my last hooping class. i’ll start another series saturday in the “intermediates,” though i still feel like a beginner. i need to find a place to practice where i won’t hurt anything when the hoop goes flying. saul: i was wondering *long pause* is that man i see you with your.... steady friend? saul: and the man who answered the phone, is he also your friend? saul: oh. all right. well, that’s all, then. and i just wanted to tell you that you have a great personality. there is something about you that draws people to you. me: okay! thanks, saul! goodbye! it’s funny when i write about it because he clearly isn’t a threat. but if he was any other man this would be creepy. i still lean towards creepy. * michaelmas & i tried tanuki, a japanese restauraun near his house. the night we went they didn’t have power in the kitchen (why? the waitress said she didn’t know) but they still had a limited menu, which i found pretty tasty. but then, i like eel. * i didn’t have much xmas shopping this year, so i missed much of the madness. but the “bike craft” show was packed! too bad, because i would have liked to have bought something there but it was too claustrophobic; i made a round of the tables saying hi to people i knew and then left. * art in december: i saw 23 sandy’s maternal book show with the local book arts group and there were only 3 of us! plenty of time to handle the books. sven & i saw scratchpdx and it was terrible: the acts were good (or at least interesting), but the MCs were lewd and they took more time than the acts! my gocco class cancelled, which i discovered after i had packed my supplies and showed up at the callbox. but at least i got a gift certificate to half & half, and i got a chance to see a small press show (red bat and loaded hips: red bat colors her letterpress cards by hand!). while we were at it, we rescheduled the creative business class, too since, the weather was so terrible. i also got to see shu-ju’s relay/replay exhibit at the rare book room at the central library, we well as the “gems of small press” exhibit, which was beautiful. 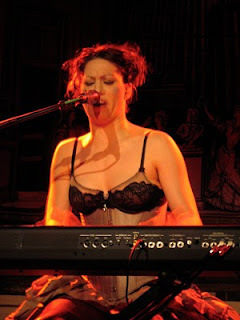 * the amanda palmer concert rocked. we got there early enough to be in the second row, which made standing outside in the cold worth it. we met a woman in line who had gone to the seattle show and snogged a member of the danger ensemble, and was at the portland show to see him that night, too. jason webley performed the exact same thing we saw him perform at the crystal ballroom with the dresden dolls. in addition to amanda’s fine song repertoire, i was hugged by a different member of the danger ensemble as part of a performance piece. during one song they shook water onto umbrellas and shook them into the crowd. only two things marred the night: sven lost his jacket, and i accidentally ran a red light afterwards, which got me a citation from a relatively kind police officer. * watched idlewild: a pretty movie, but a couple of spots where i was all, “what? they’re going to do THAT?” and we had to watch it w/ subtitles on, like vera drake. 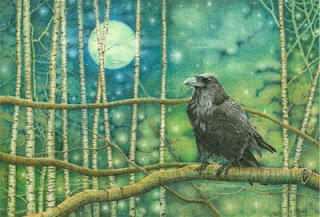 * the weather hasn’t left much opportunity for stargazing: either cloudy or freezing. but it’s been a delight to watch orion rise, one of my favorite constellations, and with him the other stars of the winter hexagon. also, i got a chance to show sven the star Fomalhaut, which made news last month by being one of the stars where exoplanets are directly observable. tonight i'll stay awake to watch the first dawn of the new year, as has been my tradition since i lived in pueblo over 12 years ago. i'll wrap up the loose ends of 2008 so i can greet 2009 with a clear conscience. see you next year! the snow, especially where we are, is as bad as they say. portland doesn't salt its roads and only barely sands major arteries, leaving the neighborhood streets to fend for themselves. we have three ways to exit powell butte, and when there's snow & ice two of them become as dangerous as walking over the backs of a pit of crocodiles in your bare feet. one of them is flatter, so if you can get onto 136th you have a decent shot at getting around town if you stay on the main streets. that's how we made it to see kristen & todd before they left to california, even though it was silly to do so; i didn't even have chains. sven sweetly put some on while i was being a patient advocate at planned parenthood a few days later, but then broke them when he drove too fast on the highway, cutting trixie's wheel wells. the storm has not been kind to trixie: the cold seems to have put her in a coma and she doesn't respond to anything, despite an attempt to jump her. though at this point, though, we can't get out, anyway; the snow is piled high and only big trucks & snowmobiles are making it through the powdered streets here. in town is easier (michaelmas & arwen are managing to survive), but multnomah county has declared a state of emergency till january 5.
even before it got really bad, the gocco class i was scheduled to teach last monday was cancelled because of the weather. too bad i didn't know it until i arrived at the iprc, though! i had gone into town early to do some xmas shopping & errands, so i missed the call. for my trouble i got a gift certificate to the half & half cafe and i saw the small press show by red bat and loaded hips. we also decided to reschedule the other class i was supposed to run that week. january is going to be a busy month! the next day i visited michael & got stuck a couple of times in his steep neighborhood. i took the opportunity to see shu-ju's exhibit at the central library's rare book room and took a bunch of pictures of the "gems of small press" exhibit, which were beautiful. the good news is that the solstice was sunday. that means we've had the longest night of the year and the sun will begin its six-month return northward, bringing spring with it. to celebrate, we tried to take the semiannual walk to the apple orchard on powell butte, but we only made it to the "kissing trees" in the wooded area before we turned around. fortunately, i'm getting better at dressing for the snow: rainboots, 3 pairs of socks (1 wool, 2 knee-high), 2 pairs of sweats, a skirt, long fingerless gloves over isotoner gloves, red coat w/ liner, 2 hats and a scarf. toasty! on our way up the hill to the butte a woman clearing her driveway wanted to chat with us -- until she learned we were from "the red house," which she had a visibly disapproving reaction to. on the day of the first good snowstorm sven sledded on the hill outside our house right into a curb and is still nursing a bruise that covers his whole leg now. but lots of other people have been playing with sleds, skis, snowboards, innertubes, etc. last night they built a ramp of snow and were flying off it as i shoveled the sidewalk. people have even come from other neighborhoods, and in general i have discovered that 3 or more boys together will average a curse word for every three words in a sentence, sometimes stringing together whole sentences of curse words loosely joined with conjunctions or pronouns. a snow story that cracked me up today: a young girl pulled her mom down the hill in a sled. when they reached the bottom the mom said, “now i should pull you!” “no,” the daughter said. "are you sure?” the mom asked. "my hands are cold," the daughter responded. "but it's fun!" the mom cried, clearly confused. the daughter rolled her eyes. “fine," the daughter said, crossing her arms and stomping up the hill. anyway, this has been the most snow portland's seen since 1968. even if the rain melts the snow and we don't get a white christmas, it's been pretty amazing. sometimes i feel like i'm living in colorado again! facebook has been overflowing with updates on the "snowpocalypse." leeann is sending missives about her trip to see her idaho inlaws. with all the holiday parties that cancelled, we don't have to go anywhere or do anything. i'm just grateful we have heat, power, food -- and the internet. 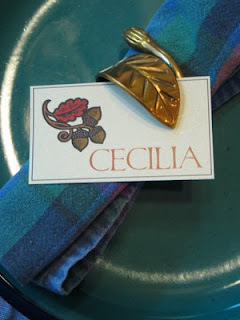 * we hosted thanksgiving with the always delightful hall family & cecilia. carl was sick on thanksgiving, unfortunately. but we cooked a mighty fine vegetarian feast w/ homemade spiced almonds, quorn roast, sven’s cranberry sauce, the best and fluffiest savoury biscuits, gravy (tofurkey & brown gravy), mashed potatoes, stuffing bought at new seasons, green beans almondine (i was very pleased with how this turned out), sven's pumpkin pie, mph’s pecan pie, alison’s salad, cecilia’s tofu olive dip & veggies, homemade whipping cream, sparkling apple cider, and reisling wine. * sven hung a painting i bought at open studios, concluding that event. then sven & i attended the "little things" show at guardino gallery because we knew so many people in it. 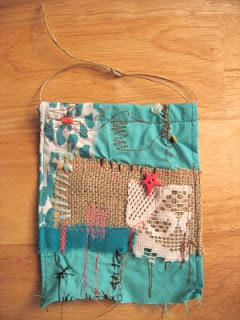 i bought a prayer flag (a prayer for an inspiring future). i went to handmade nw and contributed to the local economy: it was a pretty space in the world trade center plaza, but after a while it got a little cold. sven & i also went to "i love this town!," a show at city hall by an an artist we know. there was a simultaneous & enticing print show, where we saw jason, someone michaelmas & i hung out with several years ago. * sven & i watched "monkeybone," and audrey tatou's "he loves me, he loves me not." eh. michaelmas & i are going to see "australia" when it reaches the mcmenamin's pubs (ideally, the mission theatre). * sven & i saw jesus christ superstar w/ ted neeley and it was HORRIBLE. we complained all through intermission & all the way home and all the way on a walk afterwards. the singing was awful, the movements were sloppy and the direction was gauche. i compared it to watching TBN's "holy land experience" in florida. ted neeley made jesus -creepy-. i saw a high-school summer production of JCS in pueblo that was so much better than this. ugh. * we ate a pretty good meal at south park, which was only marred by a bland dessert. * 'tis the season for holiday parties, and ours began with an annual curry party hosted in the west hills. it's the same place the "create the world day" event is held. one woman told me that i changed her life: she attended a collage night and makes one every day now. it's not often you get to hear something so dramatic or sincere!